The chief constable of West Yorkshire Police has paid tribute to murdered Pc Sharon Beshenivsky as an enthusiastic officer who made a difference. 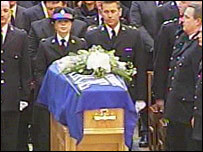 Speaking at her funeral at Bradford Cathedral, Colin Cramphorn said she had blossomed during her police career. Earlier, the city came to a standstill as 400 officers lined the route for the funeral cortege from Morley Street, where she was shot on 18 November. The mother-of-three, 38, was killed as she investigated an armed robbery. 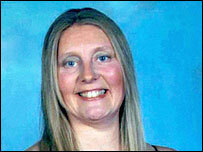 Her colleague Pc Teresa Milburn, 37, was also injured in the shooting outside a city centre travel agency. Speaking to a congregation that included officers representing every force in the UK, Mr Cramphorn said that what happened on 18 November would remain etched into the memories of many. "The shock and outrage at the events that unfolded in Morley Street that afternoon touched the entire nation and, amongst the police community, far beyond this nation's shores," he said. "Sharon saw her role as a police officer in terms of making a difference. "And she did make a difference and Bradford is a better place thanks to the efforts of Police Constable 6410 Sharon Beshenivsky." Pc Beshenivsky left a husband, three children and two stepchildren. She was killed on her youngest daughter's fourth birthday. As it made its way to the cathedral, the funeral cortege paused briefly at Bradford Central Police station where it was joined by a lone drummer and 10 pallbearers before moving on. 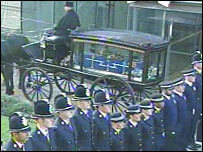 Crowds gathered in the city to pay their respects and bowed their heads as the horse-drawn carriage carrying the hearse passed. During the service, Sally Barandiaran, a lifelong friend of Pc Beshenivsky, described her as a kind, considerate and very special person. "I was hoping to put across to everybody here how much Sharon meant to me," she said. "There are so many reasons why she was my best friend it seems wrong to try and fit them into a few words. "She left an impact on people's lives. Her louder than life personality, her bright outlook and most of all, her infectious laugh which would brighten the darkest of days and, without fail, have everybody around her in stitches. "She was only too willing to help anybody who needed that shoulder to cry on." The hour-long service was followed by a private burial. Yusuf Jama, 19, and 24-year-old Muzzaker Imtiaz Shah are due to face trial in June, charged with Pc Beshenivsky's murder. Police are still hunting Mr Jama's brother Mustaf Jama in connection with the shooting.